“No-one will be lost for words”, promises the European Commission in its short announcement of the European Day of Languages on September 26, 2012. Among the many outreach events are: a multilingual 'speak-dating' session in Prague, a rap challenge in Åarhus, a European languages cocktail bar in Budapest, foreign language poetry evening in Cardiff, a 'linguistic bath' at 30 libraries in Berlin, and a Language Footprint trail for children naming animals in different languages in the UK. To see how the various European nations celebrate their languages, check out this long list of EDL events! Beyond the folklore, the European Day of Languages is an important cultural policy event, held every year since 2001 at the initiative of the Council of Europe. This year, it is destined to highlight brand new policy initiatives, such as “Erasmus for All”, the European Commission's new education, training and youth program that is scheduled to run from 2014 to 2020. This is an improved version of ‘old Erasmus’ (2007-2013) that will provide significantly more funding for Europeans’ educational mobility. Improving Europeans’ language skills is seen as a priority, since better linguistic skills are thought to provide a firm basis for better intercultural understanding in the Union. If you are not in Europe, consider signing up for multilingual blogging at the euonym.eu website for Nov. 14! The idea is to feature one or more languages on your blog that you don't usually use. Invite someone to help you, if you write in a language other than your mother tongue/ home language/ language you know the best. Linguis Europae will participate, even though we are *already* a multilingual blog site! 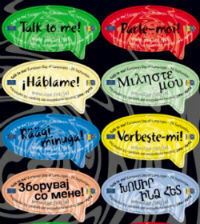 Click on a sticker like the ones you can see next to this text, saying in various unknown languages: “Talk to me”! Try to guess in what state that language is an official state language by clicking on the appropriate country on a map. Can you distinguish Slovenian from Polish, Spanish from Portuguese, and so on? Of course, if you are a euro(lingua)skeptic, you might wonder what the possible effects of such awareness campaigns could be in a Union of more than 500 million people speaking 23 official working languages, 60 indigenous regional or minority languages, and a large number of immigrant/migrant languages that remain under the political radar… Your reservations are perfectly understandable. And yet, top-down intervention (when it comes with funding) can perhaps amplify some new micro-trends similar to what is reported on the EU Commission's language policy website this month: “A new report on teaching foreign languages at school reveals encouraging information on early language learning” (click here), and “Recent trends show that in some countries learners of German as a second foreign language are on the increase” (click here). Encouraging, isn’t it? Alles Gute für europäische Kinder (deutsch oder nicht)! Zsuzsanna Fagyal-Le Mentec is Associate Professor of French at UIUC. She is an EU Center faculty, specializing in the study of the sounds of French, language variation and change in European varieties of French, and language and minorities in Europe. She regularly teaches the EUC-sponsored ‘Language and Minorities in Europe’ course and she is the chief editor of this blog site. Great blog! Thank you, Zsuzsanna. Gëzuar festën europiane të gjuhëve! (attention: "ë" is similar to a schwa sound, a mid-central vowel; "gj" is a middle palatal sound, soft like velvet:). Now you can try to say the Albanian expression! ps: The European Day of Languages is only initiated by a European institution, but I understand it as celebrating all the languages of the world and a day that can be celebrated by all people in the world. It is another day to remind all of us to be happy for our diversity! Great reply, Eda! Here are your wishes in Hungarian: Boldog európai nyelvek napját! PS. /ó/ and /á/ are long vowels, and 'ny' is the spelling of the palatal nasal, like 'ni' in 'onion' and 'ñ' in 'sueño' (dream. With multilingual websites taking over, more consumers are given an opportunity to buy any product or service they need. As an online business owner, this trend offers a new step in e-commerce which deserves a chance.